At UF, each digital collection is under the purview of one or more Curators or Program Directors, with collaborative support from the Head of Digital Development & Web Services and/or Digital Humanities Librarian. For scholarly digital projects and archives, teaching faculty partner and collaborate with Curators/Program Directors following the processes for their collections. 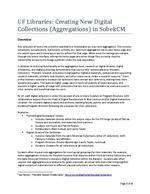 This documentation provides an overview on aggregations in relation to collection management, curatorial processes, steps for creating new aggregations, and steps and support for ongoing support for aggregations. Initial document loaded Sept. 2013. Minor update on 8/1/2014, and major update on 9/26/2014 to reflect Curator Tools which make the process of creating and tracking aggregations very simple. Updated 2/14/2019 to correct bad links and minor errors that remained from process before the curator tools existed.